The music and lyrics of this song lives in the minds and voices of thousands of Cradock students of the era from its creation and first production sometime during the school year 1946 until the school closed its doors for the last time in the spring of 1992. For nearly fifty years, this song described the essence of the student body’s understanding of their ties to the abstract ideas of community, school, group and individual goals, as well as their collective and sometimes individual ambition to achieve. Through inculcation and the skilled guidance of the school principal and wise music teachers, the Alma Mater replaced all other school songs and became what CHS stood for to the student body. Nowadays when alumni from the seventy-two years of Cradock High School gather at reunions there is no tradition more deeply ingrained than singing the Alma Mater, often with tears in their eyes. We raise our voices now to greet thee, Our school, our Cradock High. Many thoughts are ever with thee, To remain and never die. Days of value always linger, In memories long gone by. Our love for you grows ever deeper, As we strive for goals so high. Once again we stop to greet thee, March onward, Cradock High. It is to you we give the glory, Of all the things we try. Your spirit will remain within us, Our unconquered Cradock High. Several students in school in the early fifties with Tom, Emmet Powell-56, Ralph Hicks-55, Peggy Deal Reneau-55 and others verified Tom’s Alma Mater story, but none could report with more authority and personal knowledge than Ann Harris Oliver-46. Ann, like Tom Chilton, knew the Alma Mater’s author personally and remembered him well. 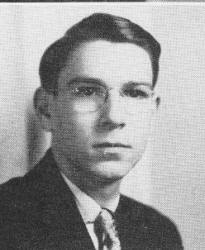 Ann, whose younger brother is Bill Harris-58, reported that the author of the Alma Mater was Richard Harrison, her classmate in the class of 1946. When interviewed Ann was certain that Richard Harrison was motivated to write an Alma Mater simply because Cradock High did not have one. It did not have its origins as a class song that later was converted to be an Alma Mater, and it was not written because of a contest. She said that Richard saw a need and filled it. The actual music for what became the Cradock Alma Mater was quasi-lifted (not enough borrowed to say stolen) from an old Methodist Hymn, “Beneath the Cross of Jesus”. Richard was a member of the Cradock Methodist Church located at 39 Afton Parkway, on the corner of Prospect Parkway and Afton. It was there that Richard was exposed to “John Wesley's Collection of Hymns for the People called Methodists” and other Methodists Hymnals, and there that he began an active role in the music life of the Methodist church which lasted for the remainder of his life. After high school and college, Mr. Harrison became a music teacher for many Cradock children and a Music Director and entertainer at most of the Methodist Churches in the Portsmouth and the Chesapeake area. The web link below is a youtube version of “Beneath the Cross of Jesus” for you to satisfy any curiosity you may have about this story’s authenticity about the song's connection with the Cradock Alma Mater. From his high school days until his death in 1996, Richard Harris lived at 63 Prospect Parkway on the corner of Dahlgren and Prospect Parkway across from James Hurst Elementary School. He taught music from a studio in that house. Many Cradock students studied piano and voice under Richard Harris’ direction. Tom Chilton and his sister Barbara, an accomplished singer, were both Richard’s students. Interestingly, Richard’s Senior Superlative was “Most Dignified”. In the 1946 yearbook on the Cradock web site he can be seen posing as ‘most dignified’ in a delightful portrait. He was President of the Cradock High School Glee Club during his senior year. He had participated in Glee Club for all four years of high school and was in Orchestra for one year as pianist. Ann Harris said that she is not certain if Richard collaborated with others in the Cradock Glee Club or with his teachers to produce the lyrics of the Alma Mater. There are no records or other evidence showing that other lyric-writers were involved but the 1946 class song and class poem committee led by Richard Harrison probably should receive some credit for the work according to Ann. Further research found that the new class Alma Mater was not immediately popular with all students. Several students in immediately subsequent classes in 1947 and 1948 could remember that their class used the Alma Mater written by Richard Harrison and company. It was not until after Mr. J. J. Booker arrived, as Cradock’s principal in the fall of 1949 that the Alma Mater was officially adopted as the school song. The new principal, Mr. Booker and Franklyn Kingdon, a 1934 graduate of Northwestern University with a Masters of Music from Yale, the music teacher and choir director at Cradock High School in 1949, determined that an original Cradock Alma Mater would be good for school spirit. Using the song from 1946 was much better than borrowing and reworking another. It seemed that every high school in America was using a version of “Far Above Cayuga’s Waters”, the Alma Mater from Cornell University. Mr. Booker and Mr. Kingdon saw that Cradock had already chosen an Alma Mater, one that was unique to the school and the community. Now the job was to popularize it with Cradock’s new students and the two of them and the schools band directors set out to do that. The Alma Mater tradition has begun. It has lasted into the 21st century although the school closed eight years before the century began. If you have anything to add, please contact Bernie at his email address.